A 57 year-old female who had been body boarding presented with a chief complaint of neck pain, weakness and pain in her arms and hands. The patient had been bodyboarding in 2-3 foot shorebreak over a cobblestone bottom when she was pitched forward by a wave and hit the bottom with the left side of her face. She had a brief loss of consciousness. For 5-10 minutes she lost all sensation and motor function of her arms and legs. She was assisted out of the water by bystanders and a 911 call was placed. Upon arrival of the paramedics the patient was awake but lethargic and was placed in a cervical spine collar and on a back board. She was seen at a community hospital and then transferred to a regional trauma center. She admitted to having had an alcoholic drink that morning. Positive for neck pain with very painful tingling in weakness in both arms and hands. Female who appears to be older than stated age. She is awake and alert and oriented to person, place, and time. In mild distress. No abrasions or contusions of the face or scalp were noted. There was no tenderness or step-offs of the cervical spine. Upper extremity exam was remarkable for 2/5 grip strength on the left and 3/5 grip strength on the right. Finger abduction was 1/5 bilaterally. Hypesthesia of both hands. There was 4/5 strength with flexion and extension of both wrists, and 5/5 elbow flexion and extension as well as shoulder shrug bilaterally. The heart had a regular rate and rhythm, and the lungs were clear to auscultation with no wheezes, rales, or ronchi. 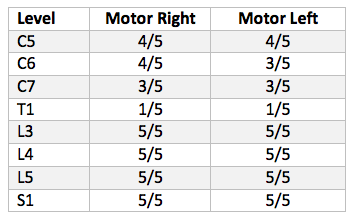 There was 5/5 lower extremity motor strength with full range of motion. No thoracic or lumbar spine tenderness or stop-offs. Normal rectal tone and sensation. The patient was suspected of having a central cord syndrome (edema of the interior portion of the spinal cord) which was soon confirmed on MRI of the cervical spine. She was given IV Dexamethasone and an arterial line was placed to maintain a mean arterial pressure (MAP) of 85. The arrow points to area of spinal cord edema. Given the patient’s relatively young age and the severity of her deficits a surgical repair was proposed. The risks and benefits of surgical decompression and fusion were explained and the patient consented for surgery. The following day the patient was brought to the operating suite where she underwent a posterior cervical fusion of C4 – T1, posterior spinal instrumentation of C4 to C7 and a cervical laminectomy of C4 to C7. An intra-operative cranial halo fixator was placed during the procedure to maintain spinal immobilization, and was then removed at the end of the procedure. The post-operative diagnoses were: cervical extension injury; central cord syndrome; cervical stenosis with spondylosis; and potentially unstable spinal injury. The patient had no post-operative complications and was discharged home on post-op day 2 with a an Aspen (padded hard) cervical collar and out-patient physical therapy. She had a small improvement finger abduction, but significant reduction of pain in her upper extremities. On discharge from the hospital motor strength was as listed in table below. Spinal cord injuries are among the most devastating injuries sustained by surfers, bodyboarders and bodysurfers. They often occur when a surfer impacts the sea floor head-first resulting in an axial loading injury of the cervical spine. This mechanism of injury often causes hyperextension of the cervical spine, as seen in this case, or hyperflexion or rotational injuries. Bodyboarders and bodysurfers are at particularly high risk due to their head-first prone riding position and the fact that they often favor near-shore hollow waves. This case was interesting because the CT of the spine showed no significant acute fractures, no signs of head trauma yet the patient had significant neurologic deficits. Furthermore, the patient had upper extremity weakness and numbness, with sparing of the lower extremities, and no urinary retention or incontinence of stool as is seen with complete spinal cord injuries. 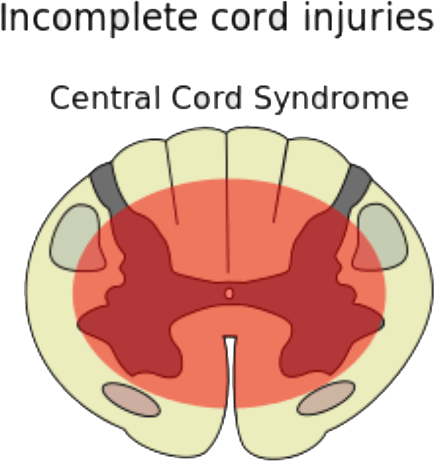 The “cape-like” distribution of the patient’s motor and sensory deficits is typical of the central cord syndrome described below. Cheng, et al (Spine, 1992) published a series of 14 cervical spine injuries among bodyboarders and noted that these injuries are associated with spinal stenosis and osteophytes of the cervical spine as seen in the case presented above. Chang, et al (J Trauma, 2006) analyzed 77 patients who suffered wave-force related cervical spine injuries in Hawaii. He found that the the typical victim was a middle aged male tourist of large build with limited wave-riding experience. Sixty-percent of the injuries in this series occurred at heavy, hollow shore breaks with steeply sloping bottom contours. The vast majority of these injuries (77%) occurred among tourists, suggesting that they were relatively inexperienced in the surf. Of the 33% of patients with neurologic deficits but no radiographic evidence of fracture or dislocation, 65% had pre-existing spondylosis, and 54% had spinal stenosis. A recommendation made in this study was that individuals over age 50, and those with known spinal stenosis or spondylolysis should be “mindful of their increased risks associated with bodyboarding or bodysurfing”. They also proposed that warning signs be placed on beaches frequented by tourists which are known to have powerful beach breaks. Hayes (Spinal Cord 2002) published a case of a 68 year-old bodysurfer, very similar to our own case. 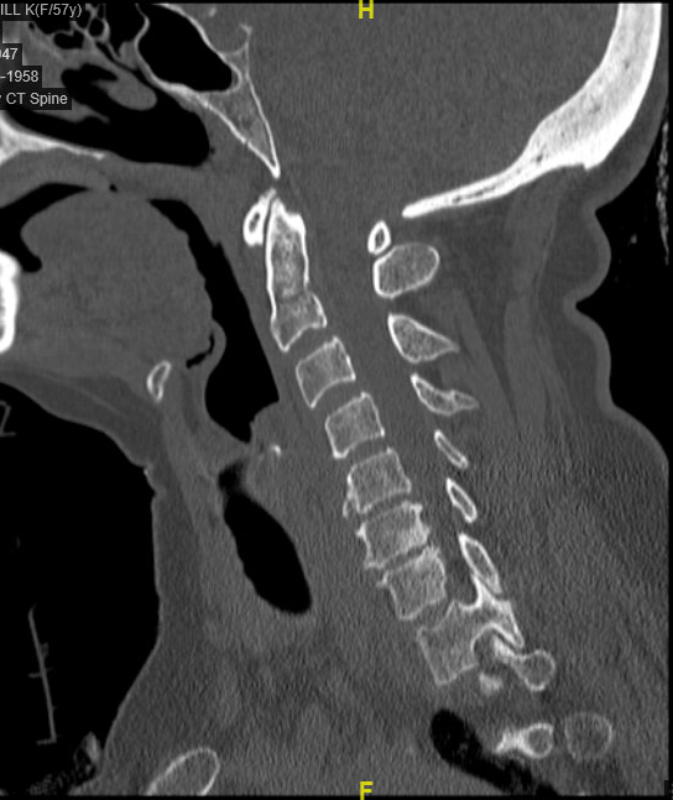 The patient had degenerative disc disease but no fractures seen on CT of the cervical spine. The patient suffered a central cord hemorrhage thought to be caused by hyperextension with transiently retropulsed discs or retroluxed vertebrae. First described by Schneider in 1954, the central cord syndrome is an incomplete injury to the central grey matter of the spinal cord and accounts for approximately 5% of all traumatic spinal cord injuries. It is most common in people over age 50 with osteoarthritis and spinal stenosis and is characterized by loss of motor function and sensation in the arms and hands with preserved sensation and strength in the legs. Urinary retention and incontinence of stool is a variable finding. 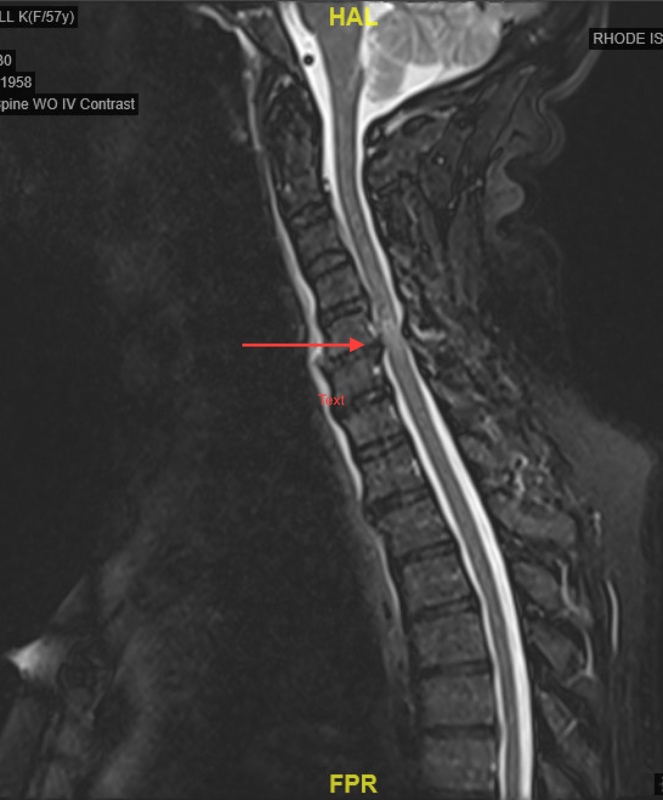 The diagnosis can be confusing as there may be no fractures or dislocation of the cervical vertebrae as is seen in the vast majority of complete spinal cord injuries. Definitive diagnosis is made with MRI which reveals edema or hemorrhage of the central (interior) portion of the cervical spine. Treatment can be surgical or non-surgical depending on the stability of the spine, and severity of symptoms. Surgery is favored for those with ligamentous or bony instability of the cervical spine or those requiring decompression due to significant edema or hemorrhage of the spinal cord. With aggressive physical therapy the prognosis of partial to complete recovery is favorable as compared to complete spinal cord lesions. Therapy involves repetitive task-specific sensory input that may involve plasticity of afferent and efferent pathways in the central nervous system.